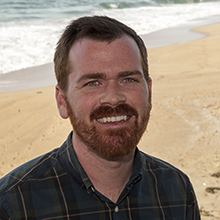 Prior to joining MBARI and CeNCOOS as Data Coordinator, Patrick worked as a Life Science Technician at Hopkins Marine Station, Stanford University. There, Patrick analyzed and maintained CTD casts and pop-up archival tag datasets. Additionally, Patrick coordinated the logistics and assisted in field work in Monterey Bay, Mexico, and Peru. Patrick also managed the husbandry program and maintenance for the aquarium room. Patrick holds a Master’s degree in Marine Science from Moss Landing Marine Labs, and a Bachelor’s in Biology (minor – Chemistry) from the University of San Francisco.